A pleasant, autumnal day with almost everyone moaning about being cold! Dougie didn’t, but then he was moving a spoil heap to make room for a new trench. Rotten photographs this week I’m afraid as I simply forgot to take very many. 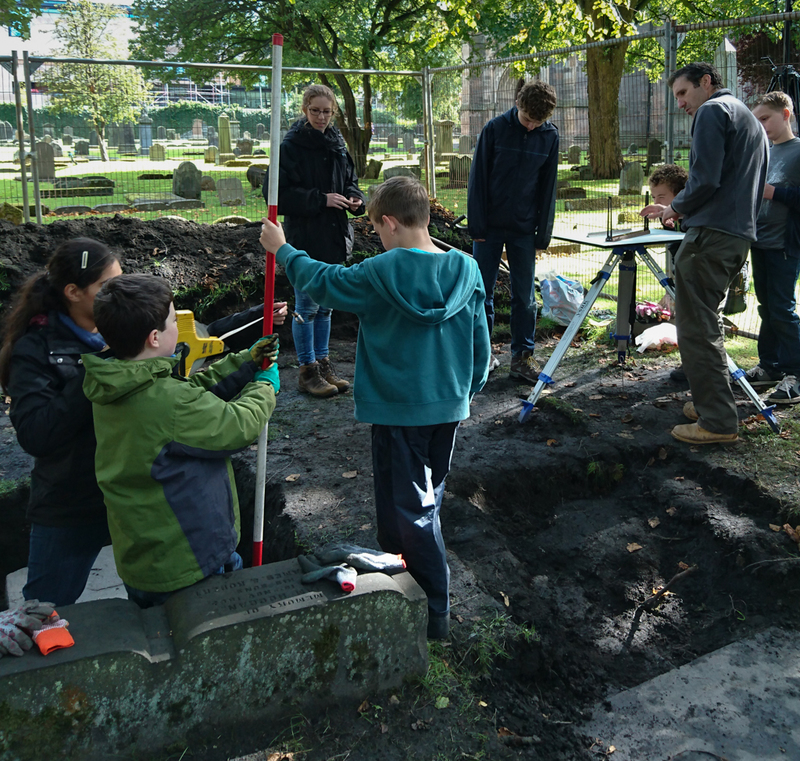 Alexander, Erin, Kathryn, Katie, Michael, Olivia, Ronan and Sienna worked away exposing the edges of the large, table stone so that we can record it, and cleaned the small headstone abutting its eastern edge. We briefly thought that Ronan had discovered a new headstone, but it turned out to be a fragment thrown in as fill. Alexander helped Charlie sorting the human and non-human bones. As you can see below we have identified several animal teeth amongst our finds. It seems likely that at least some of the bone we have recovered is not human either, but is probably too fragmented to identify accurately without expert knowledge. Naomi helped Erin, helped by Katie and then Sienna, to begin a series of larger plans of individual gravestones to go with our overall plan of the excavation. As you can see, they made a very good start. The day ended with toothpicks and brushes on the small headstone to finally reveal the full inscription. Not terribly informative, but possibly enough to identify the family represented. The top line is most likely the initials of husband and wife. The line below may well be an offspring. Sue Mowat is investigating on the premise that the stone is at least roughly where it was originally placed. Given that we have already found two pairs of stones beside this one and its larger companion, it might even be that W B and I B were parents or grandparents of whoever was commemorated on the blank table stone beside it. Has it really been only 17 short sessions in the Abbey Graveyard? It feels a little more somehow. Two new members came along today: Ronan, who it turns out is friends with Michael, and Caelan, whose name no one could guess, even with clues! I wonder if they will come back? We were also joined by Alexander, Erin, Kathryn, Lee, Olivia and Sienna, who very kindly let her dad Pete join in. They’ll all come back! 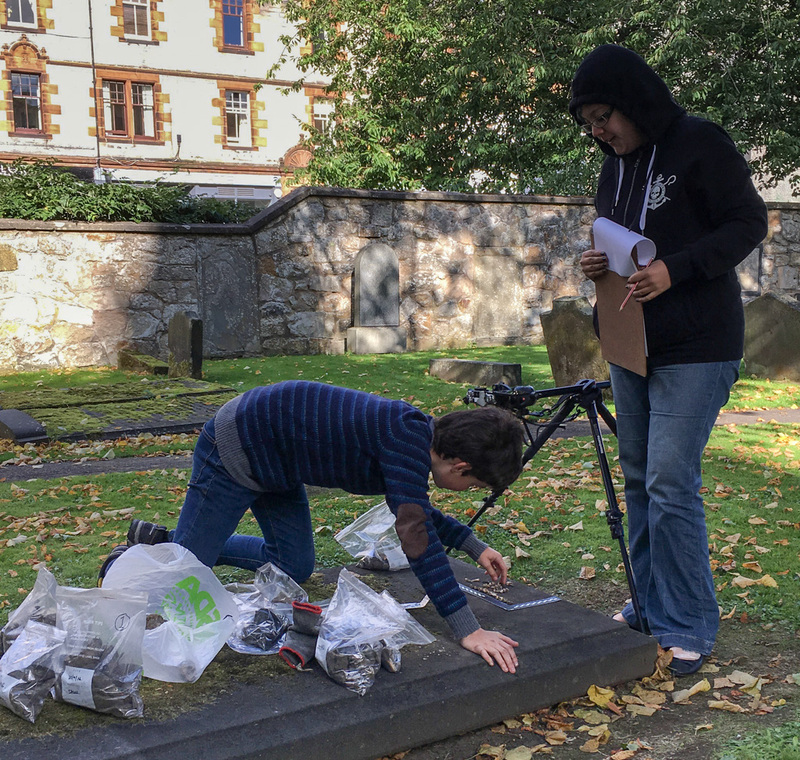 Members worked on a variety of exciting tasks, such as sorting the mass of bulk finds from last weeks session with Edinburgh YAC. 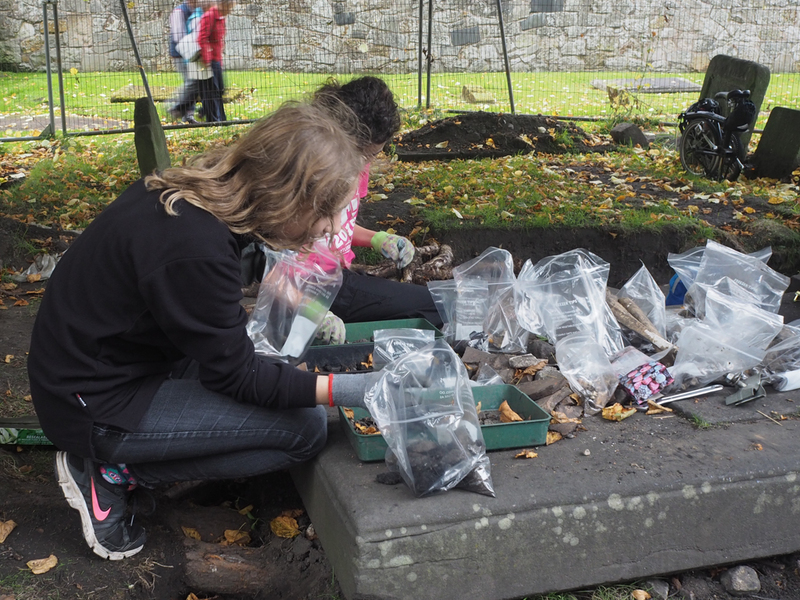 The finds trays were full and everything needed sorting and bagging up. I remember Erin and Kathryn mentioning that there might have been one or two stones amongst the legitimate finds. Kathryn loves finding small stones very much. 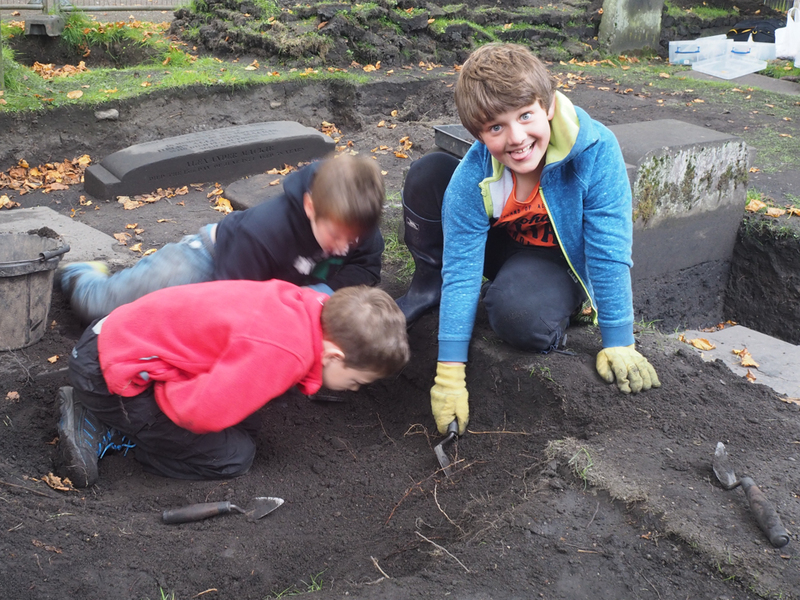 Alexander, Caelan and Olivia spent a vast amount of time and effort revealing a rather smart curb stone that once inclosed a grave plot. The ground was very dry and compacted, so excavating was hard going. I’m sure they all have assorted rippling muscles by now. 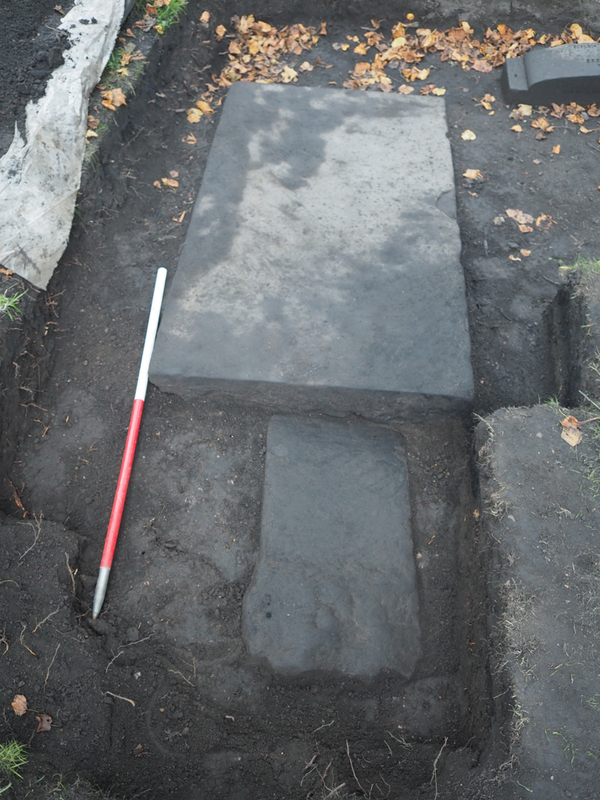 We also finally got round to excavating the wee, probably, 18th century stone that lies at the eastern end of our blank table stone. 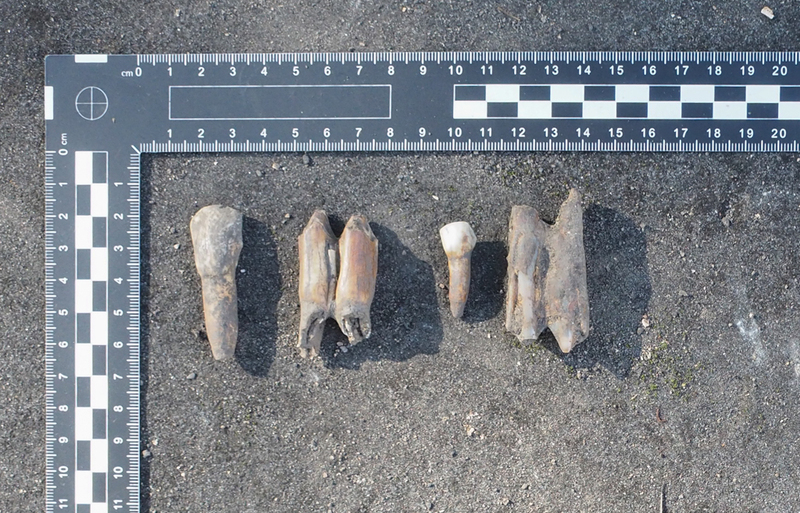 Plenty of glass, tobacco pipe bits, teeth and bone fragments came out of the ground. This was definitely the mad trench (with the honorable exception of Sienna and her dad. Charlotte wasn’t especially mad either), as you can see. 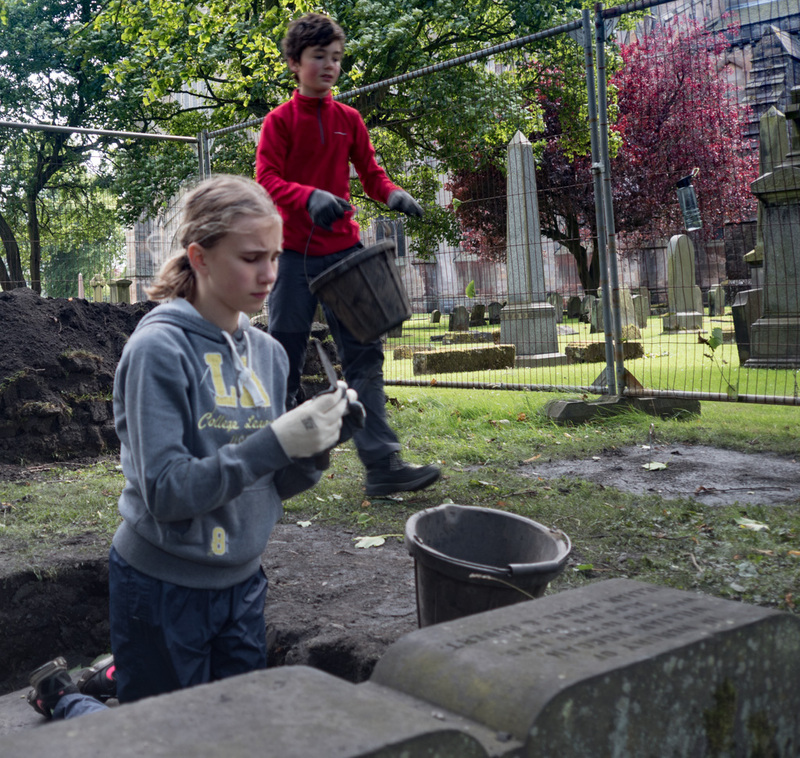 I sneaked back to the graveyard to finish uncovering the gravestone that we thought we were excavating with Edinburgh YAC last Saturday. I suppose it is possible that bits of what I found might once have been bits of gravestones, but if they were, it was a long time ago and they are now well on the way to reverting back to being sand. 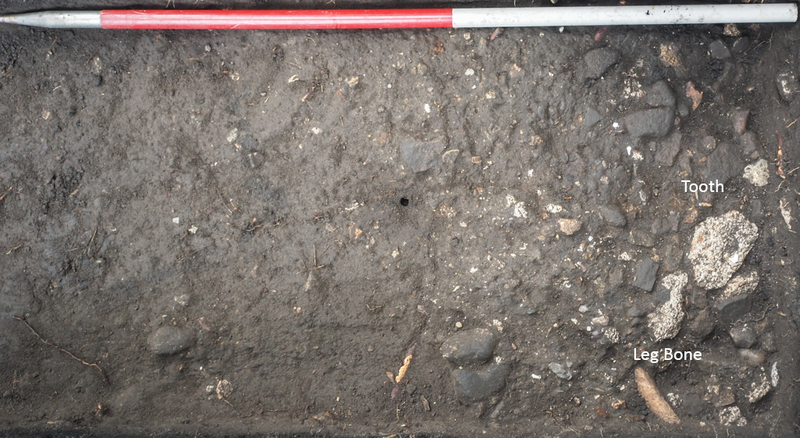 The probe had actually detected a .5m wide band of compacted rubble with human bone inclusions, that felt just like a gravestone, but, as you can see from the photograph, most definitely is not. So, what was this band of stone filling? How extensive is it? Was it deposited in 1927 along with most of the rubbish we have found on site, or is it part of an earlier feature? There was no ask or burnt coal, glass or pottery, which we had found plenty of in the context above. So, not a gravestone, but definitely something of a mystery. If only we were allowed to excavate more deeply! Bit busy today. As well as Alexander, Erin, Kathryn, Katie, Lee and Olivia we were joined by Katy Firth and about 3,000 members of Edinburgh YAC. Despite the cramped conditions everything went well and we had an amazing time, I hope! We split members into four groups, based on blood group; just in case of nasty accidents. We had four activities on site, pivoting around the patient figure of Sue Mowat as she worked on a low-marker with curb, more-or-less in the middle of the site. The Edinburgh visit was fun and got a lot of real work done too! Naomi was in charge of bones. 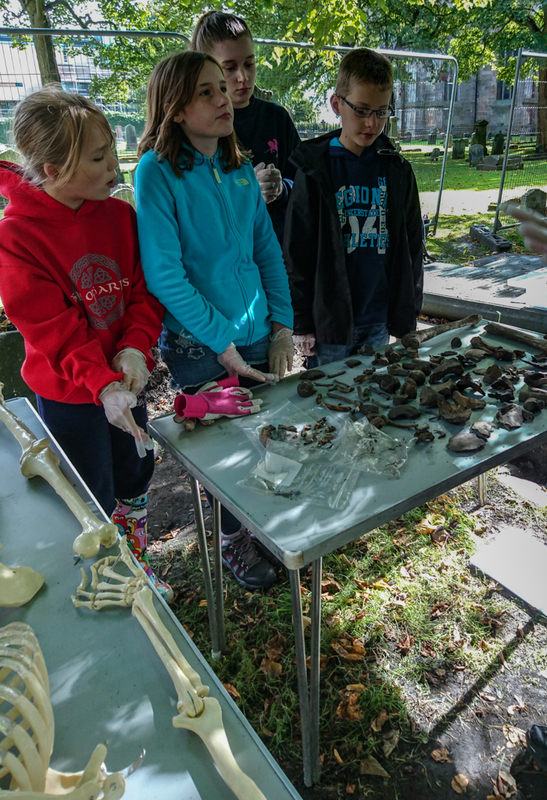 She gave each group an introduction to the skeletal fragments we have found over the season, ably assisted by Archaeology Scotland’s Jeffery, the plastic skeleton. 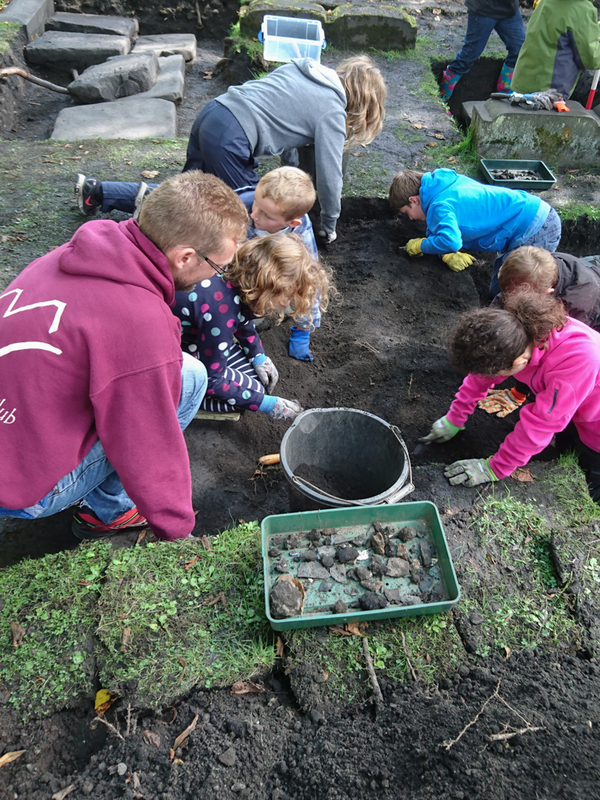 Mark looked after excavating and sieving of a spoil heap, which turned up some very nice finds. 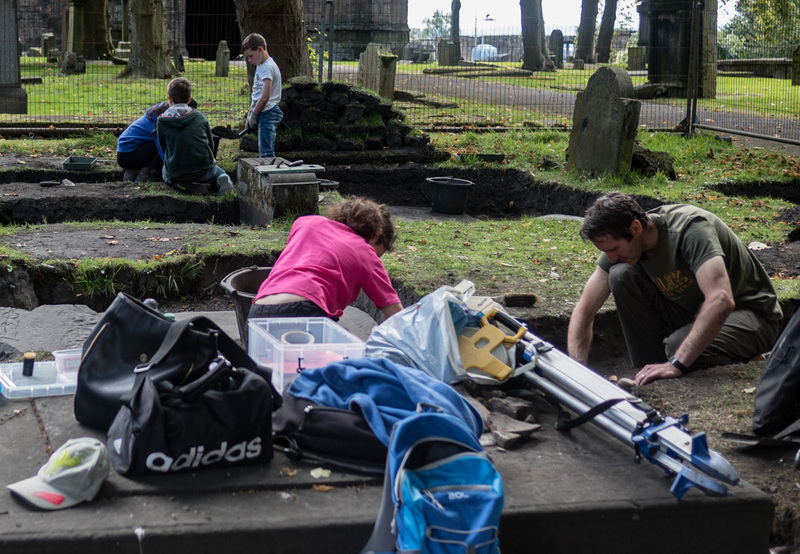 Groups took turn excavating an area that Katie and Charlotte had previously probed and been pretty certain that there is a gravestone. If it is there, it proved to be deeper than we were able to excavate. Dougie introduced each group to planning with the plane table and alidade. This can be a rather “dry” activity shall we say, but Dougie has a knack for making it both interesting and comprehensible. The net result was that far from just showing folk what to do, three gravestones were entered into the site plan. An excellent result! Peering along the alidade to take a measurement. Our last, but far from least, activity was managed by Dunfermline’s most heavily pregnant leader, Morven. Members visited the Abbey nave to take a look at the mass of medieval mason’s marks on view. 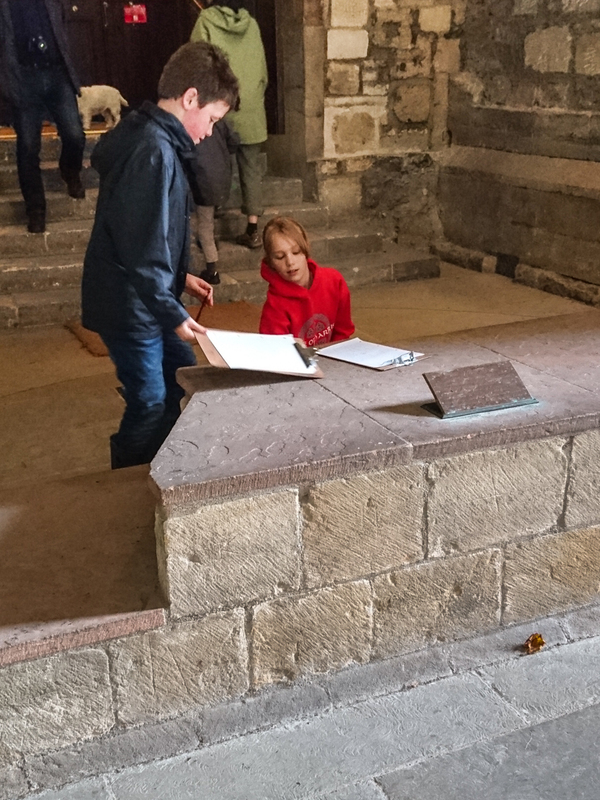 It was a great contrast to the other activities for the day and gave everyone a chance to experience the amazing space of the nave and to think about the men who built it through the marks they inscribed into it. So often we like to pigeon-hole the human actions we study into different spheres: this thing belongs to economic activity, while this is categorised under ritual and belief. The humble mason’s mark reminds us that life is rarely so cleanly divided. They had a very practical function: marks that helped managers to check the work done and ensure the workforce was paid correctly. 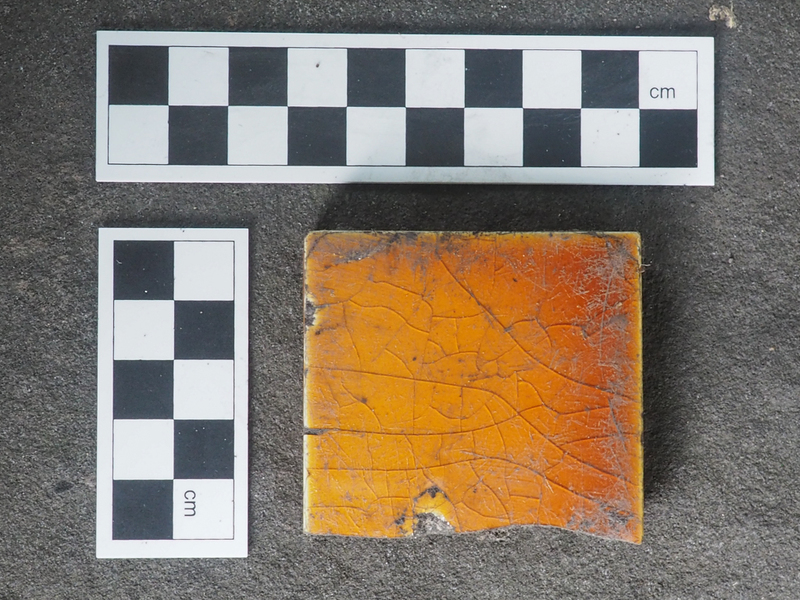 But there is also a sense in which these tiny marks, originally hidden away under elaborate decoration, represented an intimate and eternal connection between the mason and the a holy place they helped to create. The base for the old rood screen, one of the holiest sites in the Abbey is just covered in mason’s marks, but why? Our collective sympathy goes out to Charlie, who never made it to the graveyard today. Instead, she drove over a nail on the A92 and destroyed a tyre. We enjoyed a beautiful late-summer afternoon, in the dappled shade of the graveyard on Sunday. Visitors came thick and fast, with Dougie doing his public relations thing for us, while Alexander, Erin, Kathryn, Katie, Lee, new member Michael and Olivia got on with the hard work. That’s not fair of me; Dougie and Erin spent their time excavating around a low marker and curb buried in dry, compacted soil just by the tree. No inscription as yet, but we remain hopeful. Members took turns working with Naomi to photograph some of the bones and teeth that we have excavated. These will be sent to an archaeologist bone expert, while Andrew and Daniel’s mum (a dentist) will take a look at the photos of the teeth. Hopefully we will be able to learn a little about the lives of the folk whose scattered remains these fragments represent. 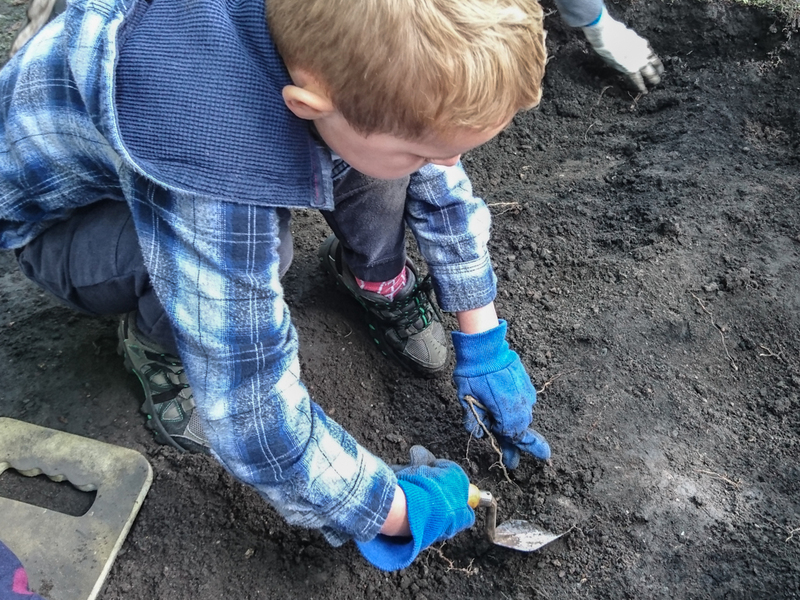 Most of us spent the afternoon digging to extend the trench containing the large, flat, empty table stone that we still hadn’t quite managed to expose entirely. 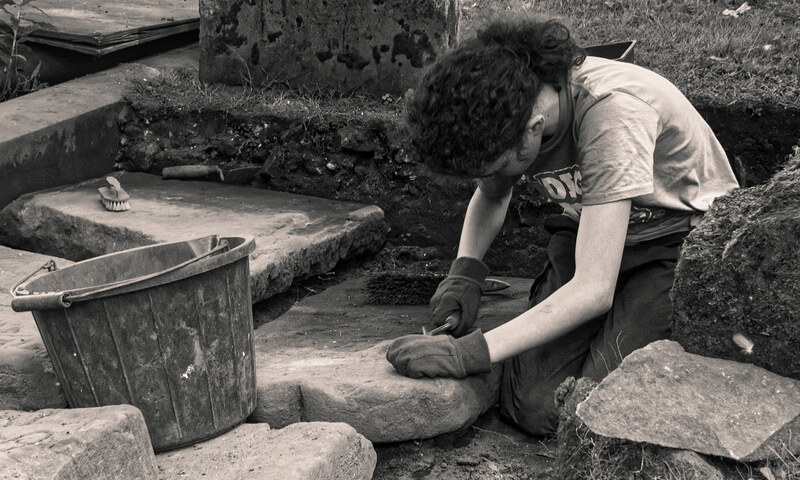 Katy, our probing expert, thought she detected another gravestone just to the east of the table stone and in the final minutes of the session was proved right. The stone was once a low, upright memorial, you can see the rough part of the stone that was intended to be beneath the ground at the front of the photograph. Excitingly, there are initials visible already: W. B. and P. B. The style of the stone suggests an 18th century or very early 19th century date. W.B. was most likely the husband and P.B. the wife. Sue Mowat tells us that girls names beginning with the letter ‘P’ were very unusual at the time, though there were a few Phoebes about. Let’s hope that there is a date on the hidden part of the stone. 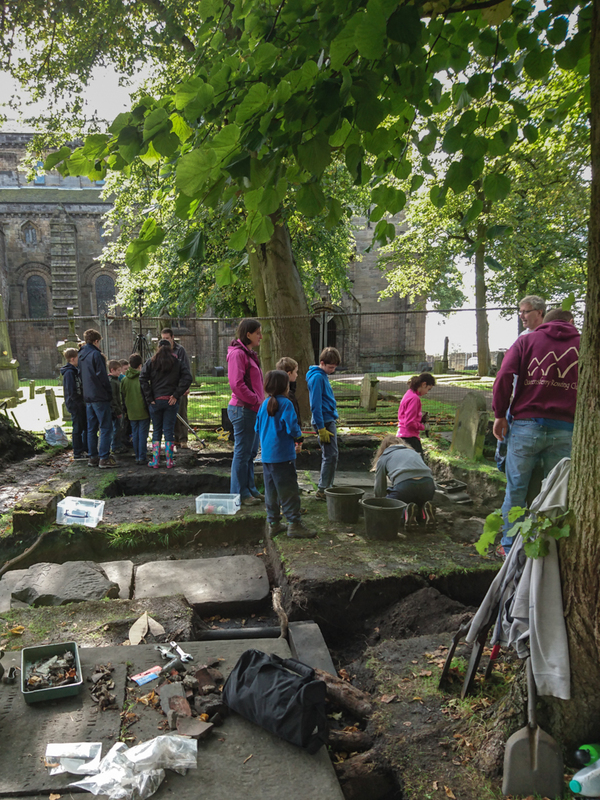 Graveyard Dig 2016 – Cobblers! I’d like to introduce the second contribution to the Blog by one of the members. 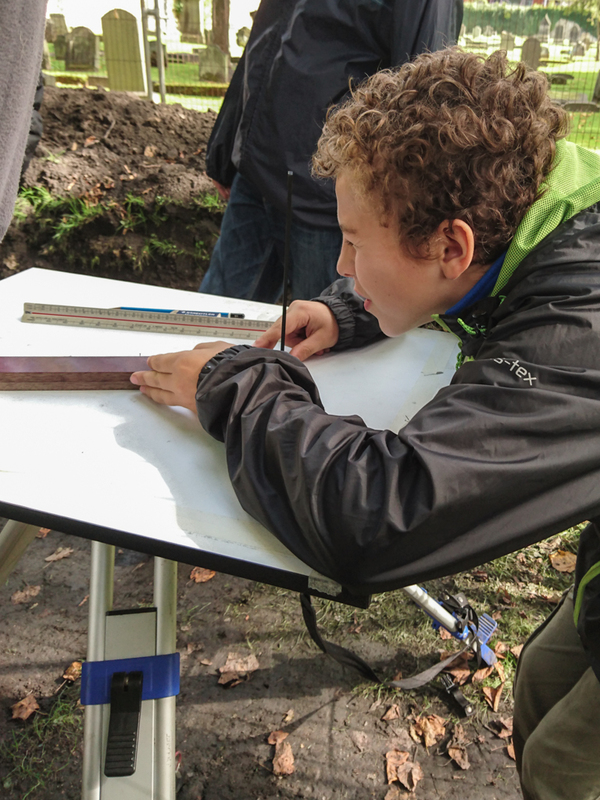 Kathryn, a quiet, thoughtful soul, muses on her experience of the summer dig and the most extravagantly decorated monument we have uncovered (so far). Kathryn has spent many happy hours re-cleaning and staring at the stone, so she knows it pretty well by now. One of the most interesting stones that we found was probably the stone covered with drawings and no words, although there is a chunk missing from the middle of the stone. The remains of what we think was once writing is worn and unfortunately half of it has gone with the chunk. A horizontal pattern that we’ve nick named ‘Dog’s Teeth’? 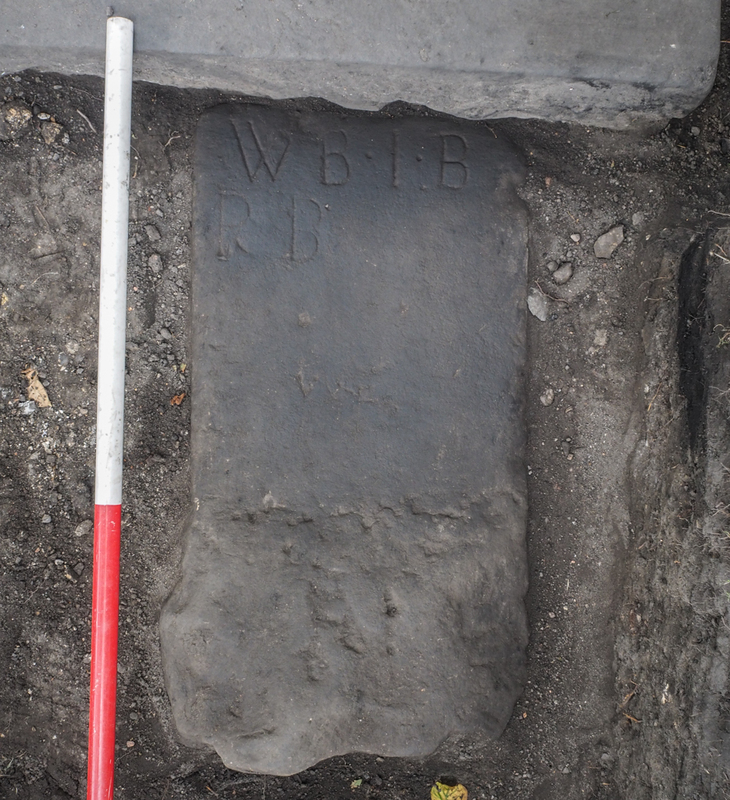 We are guessing that this stone is from around about the 17th – 18th century because at this time very few people could read, and so gravestones were decorated with the information in symbols instead. This gravestone is most likely for a cobbler, shoemaker or ‘cordwainer’. I think the flowers are something to do with the Patron Saint of Shoemaking – St Crispin – as flowers similar to this can be found in many pictures representing him. These include vases, carvings and pictures. At first we had a theory that it might be Andrew Carnegie’s grandfather ‘Tom -schoenmaker- Morrison’, but discovered that not only did he die too late for the gravestone’s time but found that he died in Bradford, England. 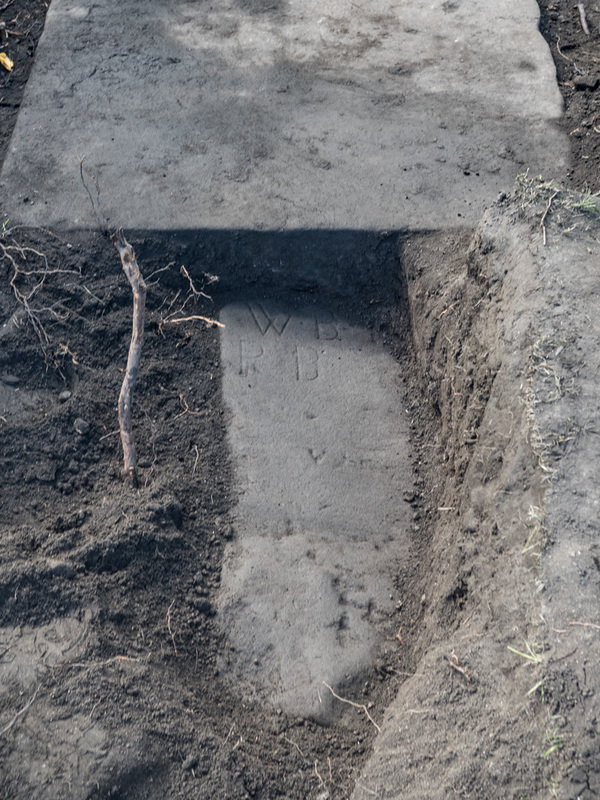 I found the names of 2 other named Dunfermline shoemakers of the time, John Jamieson – died 1765, Alexander Aitken – died 1772 – and you never know, one of them may be buried under our stone!! 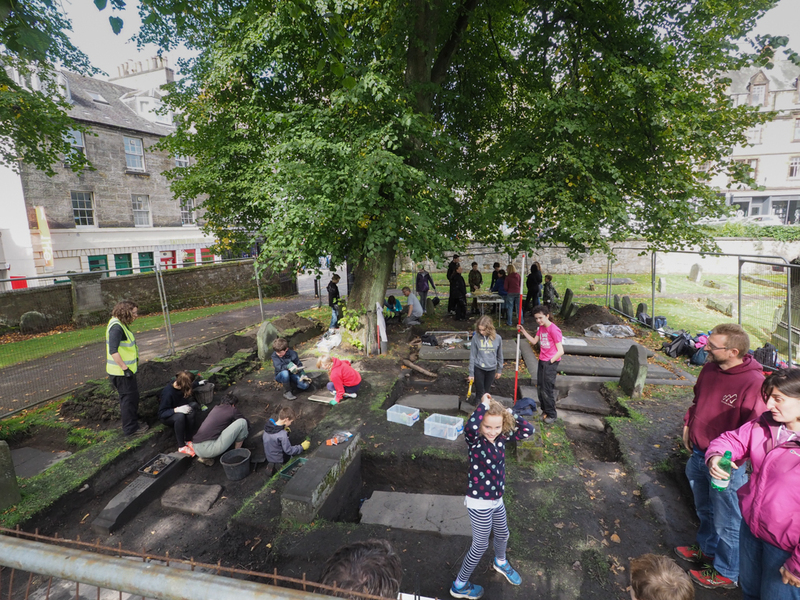 We plan to dig until October 2016 – when unfortunately we will need to re-cover our small glimpse of Dunfermline history.